Is the glass half empty or half full? Some view the goalless draw with Preston North End as an opportunity to gain three points being lost. Others say it is another point gained in the fight against relegation. The absence of a specialist winger in Warren Joyce’s starting lineup was a surprise to most of us, especially with Latics playing at home. However, he stuck with his Bogle-Grigg partnership, although the latter played behind the former, rather than them being utilised as twin strikers. In the absence of a genuine winger central midfielders Max Power and Ryan Tunnicliffe were played wide. Joyce has certainly built a team that others don’t like to play against. After the game Preston’s Irish midfielder Alan Browne commented: “We knew that they’d be at it from the start. 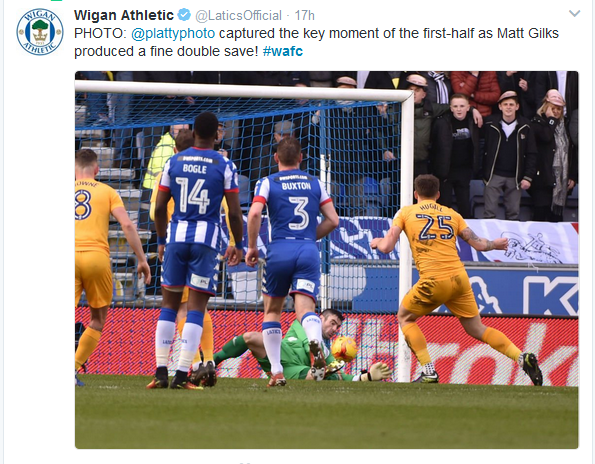 They didn’t give us any time on the ball and it was a real battle.” But, however insistent the manager might be in saying that he is trying to win games, Latics continue to look like a team playing not to lose. We can only ponder on what might have happened had Matt Gilks not made that early penalty save. A real battle today. A clean sheet and a point on positive note. We recover & get ready for Tuesday. Another massive game. Shocking game. We were sh..te as a team, too many hoofs, passes not making their man and getting under each others feet. Need to win on Tuesday. MoM Shaun MacDonald. Given we haven’t scored a goal in almost half the games we’ve played it’s understandable fans feel frustrated. Amazing that we are still in with a chance of staying up. We really didn’t deserve to win today PNE seemed far more up for it than us and our play was very sluggish. It was a great double save from Gilks that kept us in it, I would say we edged it on chances but overall we didnt deserve to win. Bogel tried very hard but looks to be carrying an injury and will be far more effective when he is as fit as the rest Will Grigg was very poor today, in my opinion he just does not do enough. A draw was the right result. I’d disagree Zakky. I thought we did deserve to win it – just. I thought we had the better of the chances, the possession and the territory. We faded in the second half but I thought Bogle caused them all kinds of problems. Like a lot of people I was a little disappointed at us not going for it with the substitutions especially as their left back was limping and Obertan would have made mincemeat of him I felt, but we are a more attacking threat than we were earlier in the season and hey ho, it’s another point in the bag. Someone please ask joyce why is he so negative & doesn’t at least try to go for it. A chance missed, made worse by Burton beating Norwich. My other half, who is the biggest critic of Latics, said it was the best game she had seen this season. I really enjoyed the game and thought we were really unlucky not to win. Love the potential with Bogle. We should have had at least 2 penalties imo and there’s was never a penalty in a month of Sundays. Onwards and upwards. Few complaints about the performance today. Can somebody ask him how many points he believes will be enough to stay up, and see if they can get a straight answer. I am ever so glad this new manager has got us so fit from when we had Caldwell in charge, my next hope is getting his team to string two passes together. Which was never a problem under Caldwell. Without Wildschut/Jacobs need an outright attacking winger. Obertan for Power made sense. Draw was probably a fair result. The game and performance just encapsulates what type of team we are at present. Plenty of endeavour, effort and organisation but not enough quality up front, which is what I feared when the window shut. Bogles efforts aside, the balls into the box be it from dead balls or open play are absolutely atrocious, really really poor. Power I’m afraid was the main culprit on this front today. Looked like a stonewall penalty for me on Bogle, he went through the back of him to win the ball and cleaned him out. The last substitution for me was poor and showed a lack of attacking intent when we need the win, I felt Obertan or weir could have come on. The lack of strikers at the club is beginning to tell, Bogle looked sha…ed out at the end and we were in desperate need of fresh legs but sadly there is no one else. Whilst I enjoyed the game I find our situation frustrating. If the season was to start now I’m pretty sure we’d be comfortable in lower mid table come the end of the season, but it doesn’t and we are still in the mire with games running out. Can’t fault the effort and application but the lack of goals I fear is what will cost us our league position. A truly awful game which just turned into a sluggish, scrappy battle between two sides that were incapable of producing any sort of attacking quality on the day. IMHO the game would’ve opened up if we’d converted the penalty but it wasn’t to be. I think you’re capable of staying up. Joyce seems to have instilled some fight into your team and the new lad Bogle looked a real handful. Add that to Bristol City’s never ending slide down the table, and you might just be able to do it. I hope you do because I like local away games, just a shame our club turned it into some sort of daft family fun day by dishing out cringey, embarrassing masks and etc. That sort of nonsense should be saved for home games IMHO as it didn’t help the atmosphere in our end, nor did the missed pen. It’s tough to say if this squad will stay up and at the moment it’s looking slightly against the Latics, but the one thing this team has going for it versus the team two seasons ago is this: this Latics team puts it all on the line. Outside of the Reading game, this team has shown it is willing to scrap and fight all season. Even to those who didn’t like either Caldwell and/or Joyce’s tactics, the players they have brought in do give all to the cause. Lastly – I’ve been looking at some soccer analytics websites, and one I’ve been reading has the Latics as the 16th in the league in terms of scoring chances for versus against. Given that, they’ve really been a bit unlucky this season and maybe there’s still time to change it. Thanks, Dan. I agree that these players are as committed as any we have seen in recent years at Wigan. Maybe that will be enough to keep us up? 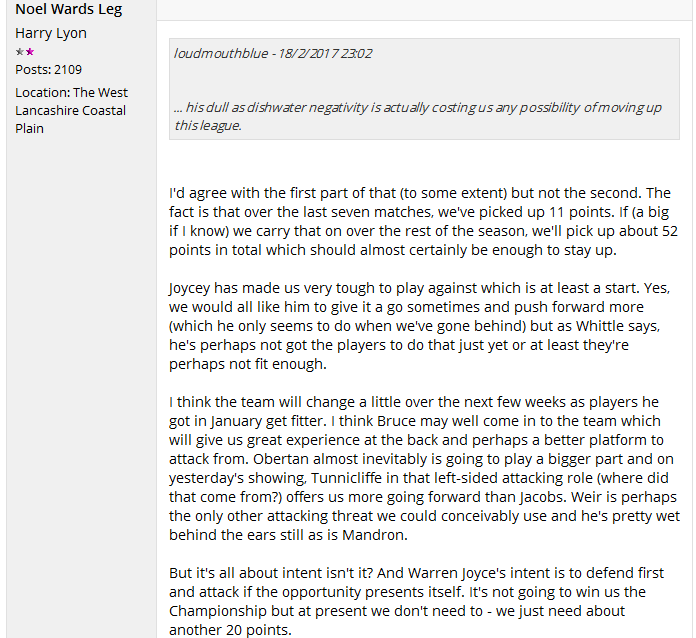 Once again points lost, does Joyce not realise we need wins to stay up ! Once again Joyce screwed up badly by not using subs. Towards the end we could have nicked it if he had brought on a 3rd sub to give fresh legs up front, should have given Obertan a chance in last 10 mins. I miss the attractive football and a team that could string a few passes together, the Joyce style does not suit many Latics players. IMO we just hoof it in the air and hope for the best, and the approach seems very negative. Joyce’s plan always appears to be try not to lose rather than go for the win. We always appear to miss Perks doing the terrier stuff and cleaning up most of the mess. Thanks, Paul. 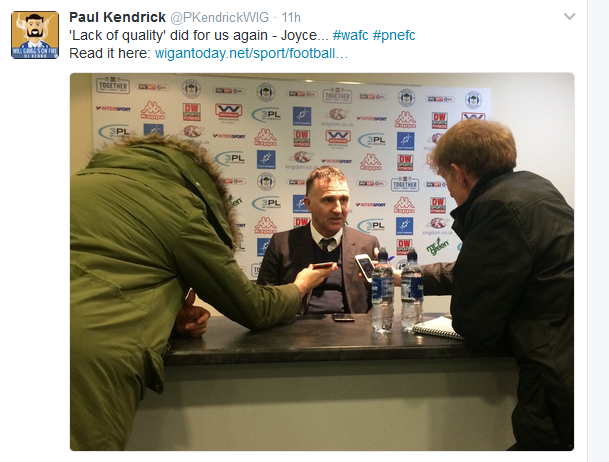 I cannot recall a Latics manager as cautious as Joyce. The lack of “football” is reminiscent of that of the days of Malky, which led to relegation. This is the other side of the coin compared with what Dan mentions above. ← Can Joyce avoid relegation?